Jose Mourinho denies Juan Cuadrado’s links Chelsea manager Jose Mourinho has ruled out all the links linking the Blues with attacker Juan Cuadrado of Fiorentina. Chelsea manager Jose Mourinho has ruled out all the links linking the Blues with attacker Juan Cuadrado of Fiorentina. 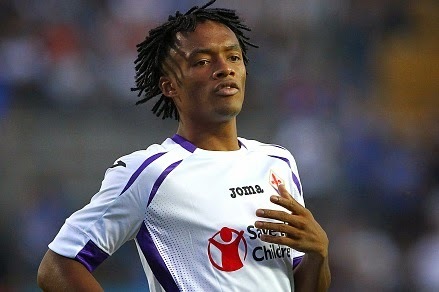 La Viola reported earlier today that Chelsea have denied the links with Fiorentina’s Juan Cuadrado. Chelsea have been linked with the Colombian winger since the summer, as per the reports. But the Portuguese boss denied all by saying that these all are rumours, nothing have been there regarding Cuadrado. Fiorentina star has been impressing in the Italian league since the start of the season. He picked up a great form in the World Cup while representing his country Colombia. Despite of the presence mate James Rodriguez for Colombia, he was the second best player for his national side. Manchester United and several other top European sides have been linked with him, however now Chelsea are leading the race. Cuadrado is one of the best wingers in Euorpe, he is making the most of his abilities like quick feet and pace. The Portuguese boss believes that he is well in Serie A but will not fit at Stamford Bridge.